The four men whose names you are about to read have 3 things in common, they all fought in WW1 for the British Army, they all died in action, they were all forgotten by the communities they lived in. It is a passion of mine to ensure that every man and woman who served and died of for their country regardless of thier background ios afforded the proper respect that their ultimate sacrifice deserves. Sadly not all people take this attitude, fortunately these people are in the minority and with the supoort and help of people such as Charles Sandbach and Geraldine Bruin,justice can be done, so when you read about these men, picture them dying alone and perhaps afraid, thinking of their loved ones back home one last time,it is the least we can do to record the names of these men for posterity. I am happy to report that the first three of these brave young men are now commemorated by the communities that they fought and died for. The fight to have George Ross added to Newtongrange War Memorial is about to begin. I will deal with Vasiliy Nikitenko first. Whilst researching the London Gazette I came across a Military Medal for this man , giving his place of residence as Newtongrange. I later found in the Gazette that in 1918 he appears in a list of dead soldiers and his worldy goods were listed as unclaimed by next of kin, this appeared for several years thereafter and his money ,all £14 14/ 5d ,still lay unclaimed, this equates to over £3,600 at todays value. The campaign medals and Military Medal he won were returned after the war , there being no one to claim them. It appears that Vasiliy was a Ukranian immigrant to Newtongrange, who was born in Poltava and had no traceable next of kin, he was killed in action May 1918. I am grateful to a member of the Great War Forum, Esdee (Stuart) for consulting the War Diary of Vasiliy's battery, 160 Siege Battery, and discovering the following entry in relation to his death. 28th May -- "" Stray round hit gun pit of 160 S carriage destroyed, 1 man killed, 2 wounded and 5 fused shells exploded. " And that was how Gunner Vasiliy Nikitenko met his end. 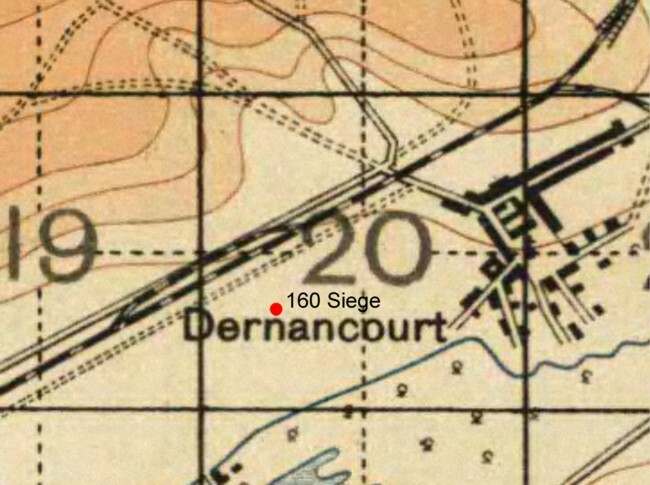 This map indicates the point where the battery were positioned the day he died. Having no next of kin he was not put forward for inclusion on the War Memorial when the names were added a few years back,indeed I only became aware of his existence this year. I contacted Midlothian Council to have his name added to the Roll of Honour on the Memorial in Newtongrange Welfare Park and finally had enough evidence to persuade them to do so.I am delighted to say that this appeared in today's (13th December 2007) copy of the Midlothian Advertiser. "The name of a Ukrainian soldier who lived and worked in Newtongrange is to be added to the village's war memorial — almost 90 years after he was killed in action in the First World War. Gunner Vasiliy Nikitenko MM of the Royal Garrison Artillery, originally from Little Russia, was a volunteer soldier who lost his life fighting for his adoptive country just six months before the end of the Great War. Vasiliy had emigrated to Scotland as a young man, and settled in Newtongrange after finding work at the Lothian Coal Company. He had already had been decorated for gallantry with the award of a Military Medal for bravery in the field. Tragically, he was killed in the summer of 1918 as he fought in resistance to the German onslaught. Social historian Dr Charles E. Sandbach said: “There is no doubt that Vasiliy was a brave man, forgotten simply because he had no next of kin to put forward his name for inclusion on his local war memorial. After a campaign backed by Midlothian Councillor Wilma Chalmers, Vasiliy’s name will finally be added to the memorial at Newtongrange Park. Councillor Chalmers said: “Having read the information I was of the opinion that it was only right and fitting that a young man who lived in Newtongrange, and who was willing to put his life on the line along with his adopted countrymen, should be recognised on our memorial stones as part of our war dead. “He paid the ultimate cost for his bravery and no matter whether you consider him to be a transient worker, or a resident of Newtongrange as evidence has proved, he chose to sign up for a Scottish regiment. 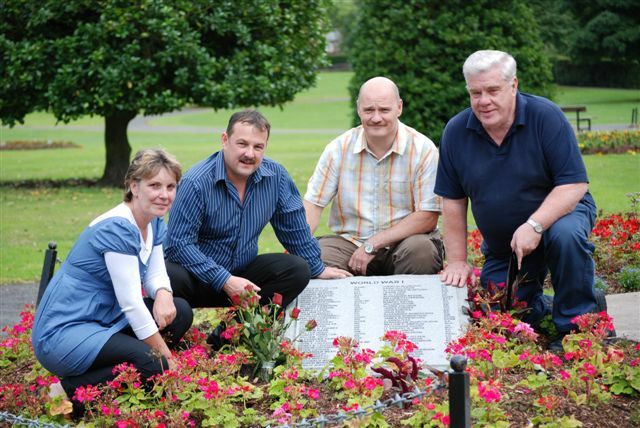 My thanks to Charlie Sandbach and Councillor Wilma Chalmers for their support in the face of some opposition to Vasiliy's name being include on the memorial." Remembered for ever by the community he chose to live in. 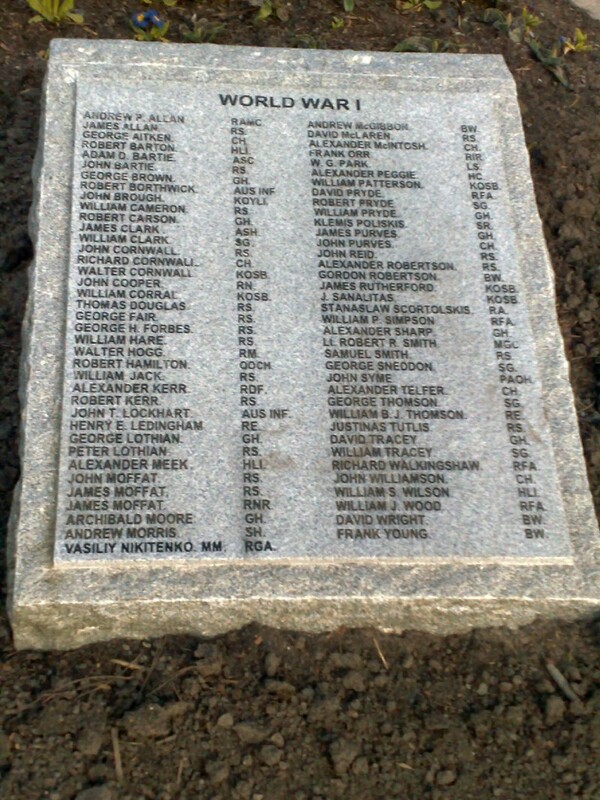 The updated memorial tablet at Newtongrange War Memorial. Unit Text: 160th Siege Bty. Grave/Memorial Reference: I. C. 22. I have been sent a magnificent group photograph by Peter Carter of Vasiliy's unit when it was formed up, he lies somewhere in the massed ranks, I am very grateful to Peter for this kind gesture. It is not really done justice at this size, so view it on the photograph gallery at proper size.